1) You’re at home, and you hear a noise outside. When you investigate, you discover that your house has no front door, and your intrusive neighbor has just walked in and helped herself to something from your refrigerator. 2) Someone knocks at your front door. You look through the peephole, and you don’t recognize the man outside. Instead of going away, he knocks harder and then insists that you let him in. Even though you don’t want to do so, you find yourself unlocking the door and letting him in. 3) A friend of yours comes over to visit. When she knocks on the door, you try to open it, only to find that it is locked with a padlock to which you do not have the key. These scenarios all sound ridiculous, don’t they? If you look at them literally, yes, they do. They make sense, though, if you look at them as analogies that describe problems with personal boundaries. These boundary problems are often called codependency. Do you have problems with personal boundaries (in other words, are you codependent)? Take the quiz at the bottom of the page to find out if you may be codependent. So what are boundaries, anyway? They are the dividing lines between you and other people. If you have no boundaries, you have no sense of yourself apart from other people, and you don’t know how to keep others out (scenario #1). Or you don’t know how to make sure your needs are met because you are putting everyone else’s needs and demands first, whether you want to or not (scenario #2). If you have rigid boundaries, you don’t (or can’t) let anyone in or let yourself out (scenario #3). Many of us don’t do well at setting and maintaining boundaries. Take, for instance, the word “No.” How many of us can comfortably say “No” to requests from others? Not many! Whether intentionally or not, many of us were raised with the belief that we exist for others more than for ourselves. Where do problems with boundaries come from? We learn (or fail to learn) about boundaries from our families. In a healthy family, each person has a right to some privacy and all of the members of the family respect each others’ needs. Parents are parents and kids are kids; parents don’t act like children, and children don’t have to act like parents. All families, of course, fall short of this ideal at times, although some do better than others. Many of my clients grew up with alcoholic parents. In alcoholic families, the boundaries between family members are not well defined, and are not respected. There are very rigid boundaries between the family and the rest of the world, however; family members present a good face to the world and hide the secret of their family dysfunction. These things are also true of families in which emotional, physical, or sexual abuse occurs. So, what does it look like if someone has good boundaries? If we continue with the house analogy from the beginning of the article, someone who has good boundaries has a front door which is generally kept locked, but which can be unlocked and opened for friends or other safe people. Healthy boundaries not only help us to say “no” to what we don’t want; they also help us to say “yes” to what we do want. better if you choose to do so, but keep them out if you don’t. Look at the people who are closest to you. Do they respect you and your needs? Do they feel safe to you? Do they make requests rather than demands, and are they willing to take “no” for an answer? If they are not willing or able to respect your boundaries, what are your options? Can you redefine or, if need be, end the relationship? In the end, the only person who is responsible for maintaining your boundaries is you. What will you do to make the changes that you need to make? If you would like to explore these issues further, you can make an appointment online, or call me at (240) 401-8086. When you were growing up, did it feel like it was your responsibility to make a parent happy, and if s/he was not happy, it was your fault? Did you grow up with alcoholism or addiction, or did you experience neglect, abandonment, or physical, emotional, or sexual abuse? Do you find it impossible to say no to requests, then feel resentful when you get overwhelmed? Do you get involved in other people’s problems even if they don’t ask for your help? Do you often find yourself in relationships in which you become the caretaker for the other person? Do you have problems identifying feelings or find yourself trying to avoid feelings? Do you tend to take responsibility for other people’s feelings or actions? Do you take criticism (even if it’s constructive criticism) personally and feel like you’re being attacked? Have you gotten into a relationship and then later found out that your partner was an alcoholic, addict, or other compulsive personality? Do you have problems with intimacy (emotional or physical)? Do you feel like you are constantly looking for “the answer” from other people, activities, self-help books, etc.? Are you extremely critical of yourself and/or others? Do you try to anticipate the needs of others and wonder why they don’t do it for you? Do you worry a lot, particularly about other people and their problems? Do you have difficulty trusting yourself or others? Do you find it difficult to accept compliments? Do you feel guilty when you do something for yourself? Do you try to control how other people act? Do you ignore the problems in your life and pretend things are better than they are? Do you take yourself too seriously? Are you afraid of your own or others’ anger? Are you extremely responsible or extremely irresponsible? Do you allow yourself to be hurt in relationships and accept behavior from your partner that you said you would not accept? Do you constantly give to others and feel uncomfortable when others give to you? Do you often feel used? Do you feel like you’re not good enough? Do you have difficulty relaxing and having fun? Do you wait to find out what other people think before you share your own opinion? Are you afraid that others will leave you and tolerate abuse so that they will stay? If your answer to many of these questions was “Yes,” you are probably codependent. The good news is that you are not alone; most women have at least some issues with codependency, although some struggle with it more than others. And, having identified the issue, you can now do something about it! Please feel free to explore the rest of the site. If you would like to make an appointment for a counseling session, you can do so online; you can also call me at (240) 401-8086 or email me at jennifer@BeallPastoralCounseling.com. And see below for information on my counseling group that deals specifically with the issues mentioned in this quiz. Do you want to feel better about yourself and improve your relationships? Do you have low self-esteem, perfectionism, and/or control issues? Do you feel like you never really had a childhood? Many of my clients grew up in families in which the children took care of their parents’ needs rather than the other way around. There are a number of things that can lead to this sort of situation, including parental alcoholism, mental illness, or chronic physical illness. One of my favorite parts of my counseling practice is leading my counseling group for women who grew up families like this. 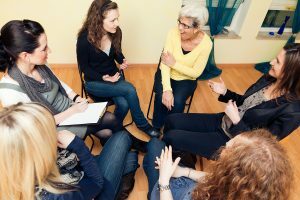 The group members hear the others tell stories about their lives, and they realize that they’ve all had similar experiences. They find support and deep connections, and they help one another to overcome the effects of their childhoods. If you recognize yourself in what I’ve said here, I’d love to have you join my group, which is held every other Saturday morning from 10:00 AM to noon. I think you’ll be amazed at how quickly and easily you will become comfortable with the other group members. And you’ll learn how to change your thoughts, feelings, and actions so that you can become the person you were meant to be. If you’re interested in the group, please call me at 240-401-8086 or send me an email at jennifer@beallpastoralcounseling.com. *ACoA (Adult Children of Alcoholics) is a term that refers to people who grew up in alcoholic or otherwise dysfunctional families.